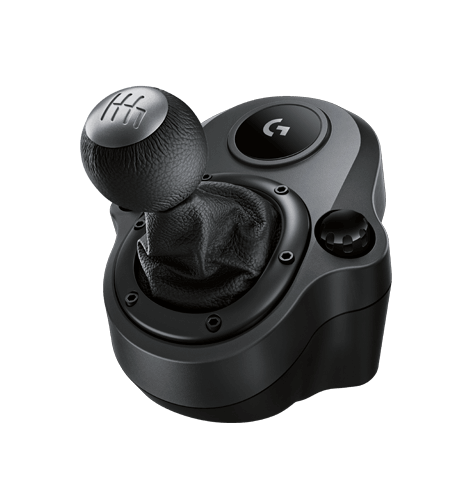 Driving Force™ Shifter is designed for both G29 and G920 Driving Force racing wheels, to enhance the latest PC and console racing titles. Add Driving Force Shifter to your racing wheel setup to complete your racing rig for a more realistic experience. With a solid steel gear shaft, Driving Force Shifter is built for precision racing and long-lasting reliability. The knob and boot are covered in high-quality, hand-stitched leather, giving it a look and feel similar to a high-performance race shifter and giving you a more comfortable, durable experience.. The six-speed “H”-pattern shifter moves fluidly and solidly clicks into each gear, helping you execute smooth, accurate gear transitions on hairpin turns and straightaways. Durable built-in clamps allow Driving Force Shifter to be mounted securely to a table or racing rig to minimize shifting or wobbling during aggressive race maneuvers.